Bookings are now open in Malaysia. 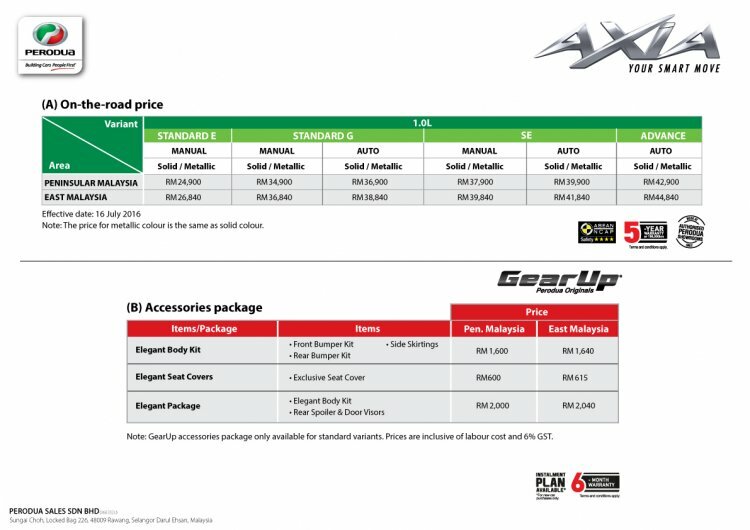 The brochure, as well as price list of the 2017 Perodua Axia, has leaked online, revealing all changes ahead of its Malaysian launch this month. Bookings are currently open in all Perodua dealerships in Malaysia. 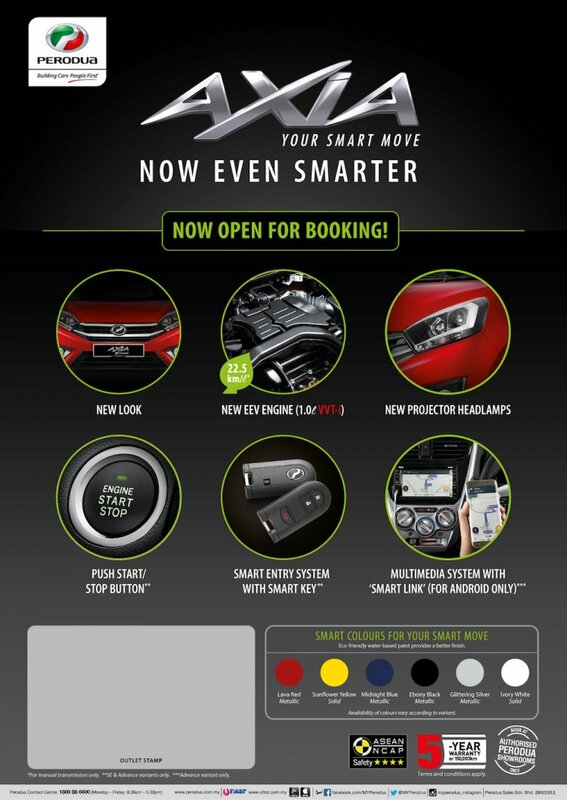 Bookings are currently open in Perodua dealerships in Malaysia, but only for manual transmission. The front-end of the 2017 Perodua Axia features a new 2-slate chrome grille, sportier bumper and headlight design for a new look. The Standard E and G variants come with projector headlights for the first time as standard, replacing the previous reflector items in the said variants. Other new exterior features are a tailgate handle, chrome door handles, “spiral design” alloy (SE and Advance only). Inside, the Standard models of the 2017 Perodua Axia get new fabric seat upholstery and a USB port for the audio system. The SE and Advance models come equipped with features sourced from the Perodua Bezza, such as keyless entry, start/stop button, touchscreen infotainment system with “Smart Link” screen mirroring for Android phones, and a revised instrument cluster design with white illumination. Under the hood of the 2017 Perodua Axia is the 1.0L 3-cyl petrol engine which gains VVT-i (variable valve timing) as standard. It produces one hp and one Nm over the outgoing model, delivering 67 hp at 6,000 rpm and 91 Nm at 4,400 rpm. Transmissions are the same five-speed manual and four-speed automatic gearboxes. Malaysia's cheapest hatchback is pricier but offers a specificational upgrade. Prices of Malaysia's most economical hatchback has risen; the 2017 Perodua Axia is priced at RM 24,900 - RM 42,900 (on the road including insurance).